An active member of the Bath Heraldic Society and its Chairman 1977-78, his life was tragically cut short by a motoring accident on the 8th November 1978. His lectures to the Society were always detailed and original in content, and he was closely associated with the Society's occasional publication, The Tabard, almost from the beginning. It was his skilful artwork that had enhanced so many of its pages and his guidance as co-editor inspired the improvement of each successive issue. Some of his research also appeared in the Coat of Arms, and a few months before his death he originated a lively correspondence in The Times on the subject of the arms of Pope John Paul I. Fortunately for the City of Bath Heraldic Society, Terry left a considerable amount of artwork and articles in draft, which were published in subsequent issues of Tabard. 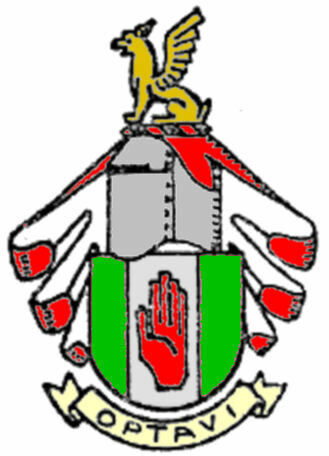 This information is condensed from an appreciation which was published in 1980 in issue no.7 of the Tabard, and these arms were illustrated there. The tinctures of the shield are believed to be as he used them, but that of the crest is a pure guess. Accurate information on the achievement and its authority, or indeed a better image, would be greatly appreciated.